Interoperability is the key objective for e-Health initiatives across the country. The goal of this is to implement a set of patient databases to which healthcare organizations contribute data. Exactly the issue HospiCarePro (Live Version) have addressed! HospiCarePro maintain a unique and dynamic Patient flow. Either as an outpatient (OPD) or inpatient on admission (IPD). This flow reflects on patient record and it's availability at various demanding points (with appropriate access) and also payments and confirmation at the various service points (laboratory, clinic, pharmacy, GOPD e.t.c). This reduces drastically the burden of physical file movements from one point of the hospital to the other. And also, the case for manual verification of payments for hospital services and purchases. Most importantly, are the total elimination of possible payment falsification or manipulation. Same it is for manipulation, stolen or exposure of patient medical record to the wrong hands, during the process of file movement. Medical and Transactional Records in HospiCarePro were designed to reflect the primary objectives of HospiCarePro; Quick, Ease & Transparency. Record retrieval is sure easier than pronoucing the word 'Easy! With options such as Patient ID Card swapping on Card Reader, Fingerprint and great user interface for easy searching. HospiCarePro provides a unique data processing and storage system. Database records are 100% encrypted with a custom algorithm of high bits. Which are only decoded to readable format for the viewer /user of HospiCarePro. This was carefully considered and designed to ensure high data security, both at application level and also database level. Specialty modules include dental, ENT, cardiology, ophthalmology, orthopedic, chest, general physician plus dialectology and skin dermatology, gynecology and others are designed to be modular, integrated and offer a user-friendly graphical user interface as well as being easy to operate and can be customized from the system setup/configuration to reflect their uniqueness and functions. Users (Physicians and Nurses) of various Specialty Clinics have peculiar access rights and permissions, which are only permittable to their clinic. Patients are referred from other various Specialty Clinics and also from IPD (GOPD). Also, Specialty Clinics can manage attached Admission Wards/Beds as well as have access to features pertaining to Inpatient System. Interactive consulting and laboratory environment with powerful integrated tools and components. Yet, simple and easy to use! With the help of our Team of Consultants/Doctors, over the years, our Consulting Interface has evolved from an interface with some 'clicks' and 'fills' to a robust and rich environment, yet easy and exciting. 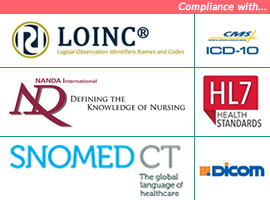 HospiCarePro Consulting & Laboratory Environment (IPD/OPD) is equipped with Diagnostic and Decision-Support tools such as: ICD10, HL7, DICOM, LOINC, SNOMED, and NANDA (for Nursing CarePlan). All in line with WHO/ITU standards. Designed to accommodate all available Investigation Centers (Laboratories) and their peculiarities. From Chemical Pathology to Hematology, Blood Transfusion, Crossmatch Serology, Donation, Histopathology, Cytology /Fine Needle Asp., Microbiology & Radiology. Access and activities on these various Labs are strictly by UARC (User Access Rights Control) System. Which means, the needed rights and permissions to operate in these labs are only assigned to the right people (at the right time). Payment for each services are done through the any of the available cash points, with instant confirmation in the appropriate lab. Specimens are also recorded along with demanding investigations and results are sent directly (online) to the requesting clinic/physician. ProfitaaBPM Rx is attached to HospiCarePro as a standalone (independent) but integrated into the entire application. Profitaa is a World-Class inventory, sales, CRM system with awesome features such as Multi-pharmacy outlets, mini-warehouses, warehouses, Adverse Drug Reaction alerts, movements, dipletion, stock management e.t.c. Each pharmacy created in ProfitaaBPM operates independently with it's own attached mini-warehouse (this is different from the Master Warehouse). Stock can be moved between pharmacies, mini-warehouses e.t.c Also, report can be generated at each of these levels. With inbuilt decision support systems like the; ICD 10, HL7, LOINC, SNOMED, and NANDA (for Nursing CarePlan), Adverse Drug Reaction Alert e.t.c Caring for patient the right way just get easier and smarter! Reports from the activities of these support systems are of high importances. Both to the hospital and the state generally. These reports can help to determine health indexes like; fatality rates, mortality rates, prevailing diseases (epidemic prevention) e.t.c Which can help in taking the right decisions on time. Another interesting component of HospiCarePro it's the Knowledge-Center. An online library opened to all medical personnel (ofcourse with the right access), for medical research. It's self-updating, self-improving from procedures carried out in the hospital or connected hospitals. It contains in visual and text-format, processes, patterns and routines for certain medical procedures, treatments and medical journals. Another distinctive feature of HospiCarePro (Live Version only). It brings Telemedicine capabilities to the application, enabling medical teams to connect live (audio/visual) to an external consultant or medical team. Procedural notes are auto-captured and saved to the Knowledge-Center as well as audio and visuals. This process is routed via a secured VPN with Firewall, and both teams are connected on HospiCarePro Live. A minimum of one High-resolution video camera, condensed microphone (drop-down), wide-screen and good internet connection is required for a good Live-Center session. Detail report on all Financial Transactions across the Hospital, including daily reports from all cash points (Yes! Unlimited cash points can be created and attached to clinics), Daily collection reports, Cashier-Session Report, Real-time Share & Commissions Report and general Financial Performance Analysis. Others include Special Accounts, VIP, Retainership, e.t.c with extensive report on each portfolio. Reports can be exported to MS-Excel OR PDF, also with Graphical (Pie Chart/Bar Chart) view option, using any selected columns as index keys. Every user of HospiCarePro belongs to a security group, with rights and access well defined. These access can be set for expiry at a set date/time. Also, functional roles have specific priviledges. This is to ensure only the right people can perform certain tasks pertaining to their job functions. Activities and tasks performed are logged to the audit databank, along with user information /time/date/ip.address e.t.c And can be queried for user performance check and appraisal. HospiCarePro reports are both departmental (module) base and general. Each department/module can generate independent report of their activities and transactions. Also, the Report & Statistics Center can do all that and even more from a wholistic perspective. Special Reports such as Registrations, Diagnosis, Consultation, Admissions e.t.c can all be generated using custom queries and conditions and can be exported to MS-Excel OR PDF, also with Graphical (Pie Chart/Bar Chart) view option, using any selected columns as index keys. Statisticians and Researchers are not left out, as extensive reports such as possible epidemic outbreak and other medical and scientific reports can be generated via this robust module.